Some parents go the extra mile, and Austin, TX dad Graham Lloyd is definitely one of those parents. Graham’s two daughters are just about the biggest Frozen fans you’ll ever meet, so he decided to do something special for them. 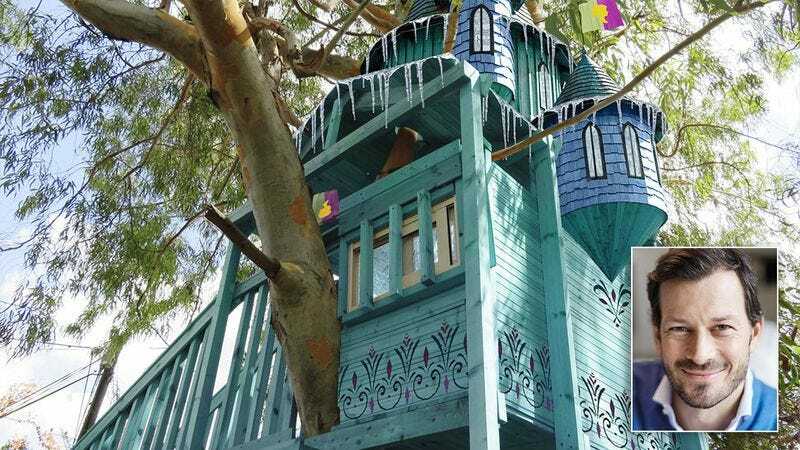 And after one weekend hard at work in the backyard, Graham built the most epic Frozen-themed treehouse ever, basically locking down full custody of his kids. When Becky and Allison came home from school and saw the treehouse, they were speechless—although they certainly didn’t have any trouble singing along to “Let It Go” blasting over the treehouse’s built-in surround-sound system. That’s right, surround sound in a treehouse! Let’s see Sharon match that! From the retractable ladder with rungs decorated to look like Sven’s antlers, to the balcony that’s a near-exact replica of the one from Elsa’s palace, Graham’s workmanship alone clinched him weekend visitation rights. Throw in a life-size replica of Olaf, and the girls are practically begging to skip their days with Mom! While the cost to construct the treehouse was high, it was all worth it just to see his daughters smile, and also because he’ll now likely avoid paying the legal fees of a prolonged custody battle. This gesture totally secured Graham “favorite parent” and “full-time legal custodian” status! Great job, Graham! Anyone would be lucky to have you as their father!